I'm pretty new at this. I was able to salvage the motor of a washing machine. How will I know if I can reverse the rotation of it? And how will I be able to reverse it if it does? Also how will I know if this is an induction motor? Single Phase or 3 Phase? It doesn't say anything like that on the name plate. Here are the details on the name plate. 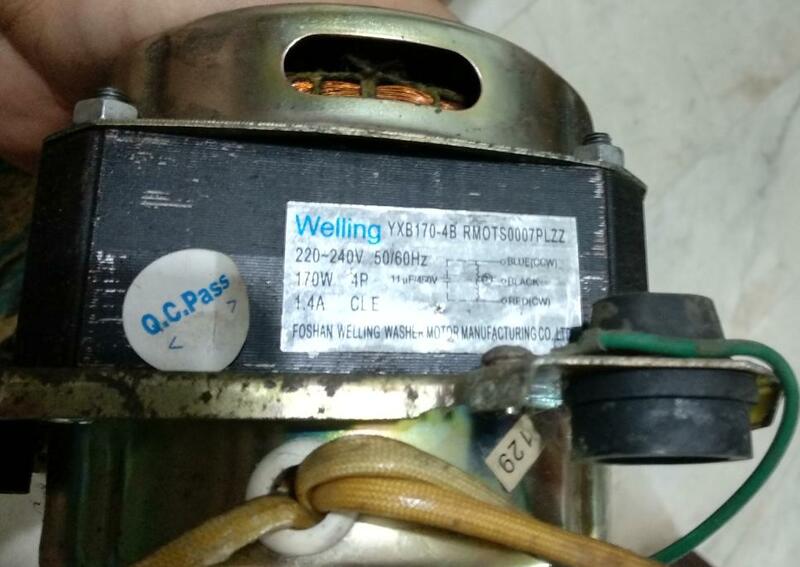 FOSHAN WELLING WASHER MOTOR MANUFACTURING CO LTD. It has some sort of diagram on the right. I opened a box where the wires go to and this is how it looks like inside. Unfortunately when I opened it, there was a spring that jumped out and messed somethings inside. I tried to put things back together as best as I could but not really sure if I did everything right. At the moment, I would not dare plug it to an electric socket as I don't want it to blow up in my face or something :D.
Is there anyway to run this off using a battery? Hopefully this would be safer. Appreciate it if someone to guide me thru it. After messing up the box with all the gears, I'm a bit afraid of plugging it to the power since I'm unsure what will happen. Anyways, I would like to ask for some assistance. Here are a couple more images which I'm hoping to help me explain what I need to do. In the image above, I labeled the objects based on my understanding. B - This was the box that had the knob for turning the washing machine on. C - Capacitor. Label says "SH CAPACITOR. SH.M 400 VAC 50/60Hz 11uF (-5/+10%) NUINTEK/KOREA". The image above is a close up on the box (B in Figure 1.0). I labeled somethings that I have concerns with. B - A metal that connects to a blue wire that connects to the motor. C - A metal that connects to a red wire that connects to the capacitor and motor. A black wire then connects the capacitor to the power. The metals (Figure 2.0) B and C are currently not connected to metal A. I haven't tried it yet but my guess is if I plug this to power, nothing will happen since these metals (B,C) are not connected to metal (A). 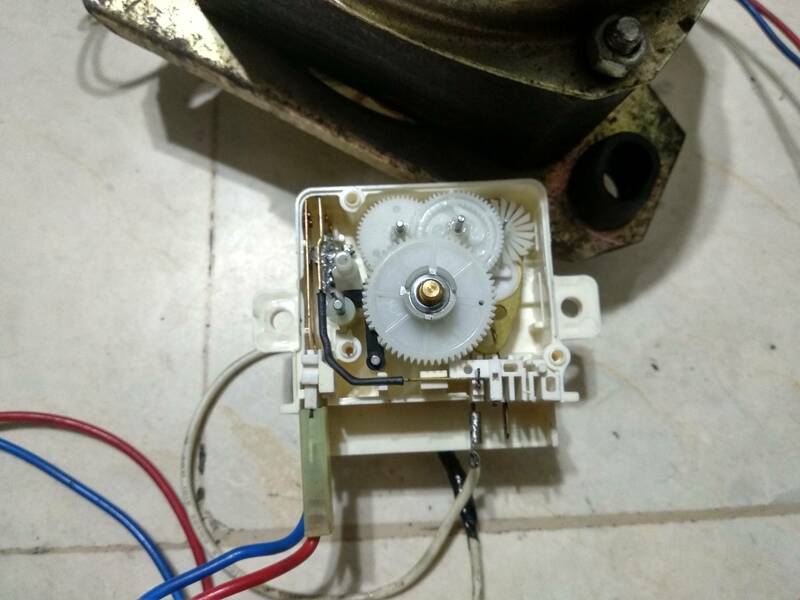 If I want to turn the motor on, should I have metal (B,C) connected to metal (A)? If so, can I connected them permanently? If I wanted to reverse the rotation, should I connect the blue wire to the capacitor instead of the red one? The motor is a single-phase induction motor of the permanent-split capacitor type. It is called permanent-split-capacitor because it is a split-phase motor with the capacitor permanently connected rather than connected for starting and disconnected after the motor comes up to speed when started. The diagram on the label that shows the windings and capacitor indicates that to people familiar with single-phase induction motors. The label also shows how the power is connected for clockwise (CW) and counter-clockwise (CCW) rotation. That is described in the comment by Humpawumpa. The neutral of the power source is connected to the black wire and the hot wire is connected to either the blue or red wire for either CCW or CW operation. To run the motor using a battery, you need a power inverter that converts the battery DC voltage to 220-240 volt AC voltage. The inverter must be capable of supplying 1.4 amps at 220-240 volts continuously. It also needs to provide a higher current for a second or so while the motor is starting. That higher current may need to be as much as 10 amps. Operating with a battery is not safer than operating directly from 220-240 volts AC. Reversing the motor without waiting for it to coast to a stop would be the most stressful operation for an inverter. It would also be stressful for the motor. The motor may or may not be designed for that. The washing machine timer limits how it is reversed and how often it is started. 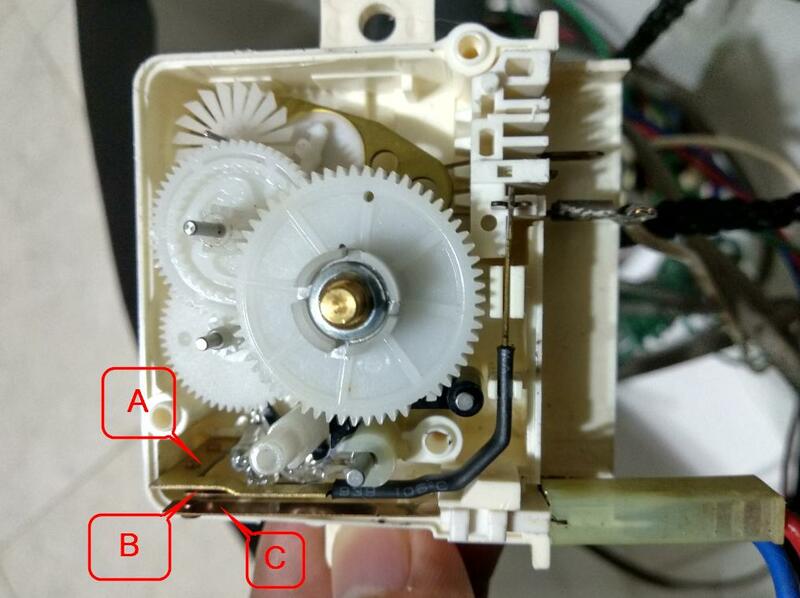 The motor is likely not designed for more stressful duty than allowed by the washer timer. Not the answer you're looking for? 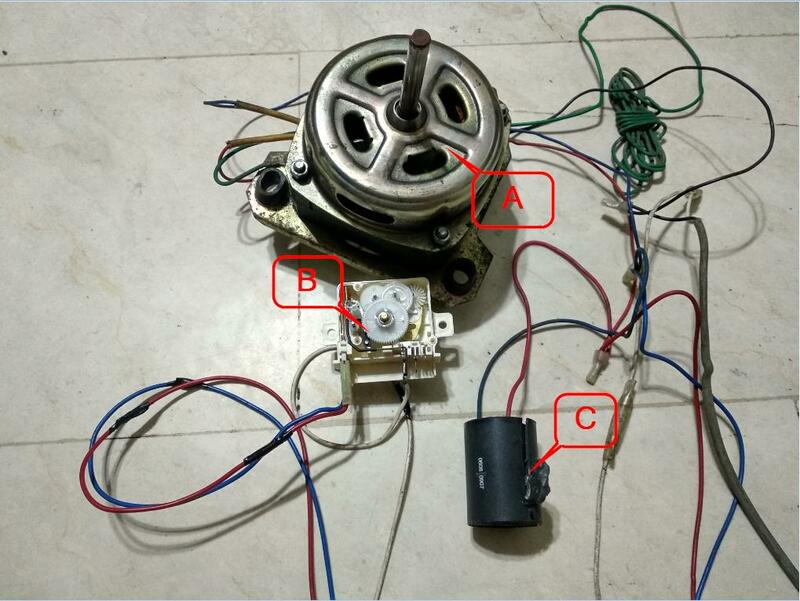 Browse other questions tagged motor induction-motor reverse or ask your own question. The leads of my 3-phase motor are incorrectly labeled. How do I determine the correct labels?